Dr. Brent Bowen discusses both the history and relevance of his Airline Quality Rating, which he has published with Dr. Dean E. Headley of Wichita State University since 1991, as well as altmetrics, or alternative metrics, for measuring research impact with host David Ehrensperger. In celebration of Open Access Week 2018, guest Laura Pope Robbins - Associate Library Director for Access Services at Embry-Riddle Aeronautical University's Christine and Steven F. Udvar-Hazy Library and Learning Center in Prescott, AZ - discusses Open Access, textbook affordability, and related issues with podcast host, David Ehrensperger. During Episode #2 of ERAU Prescott’s Scholarly Communication Corner, Embry-Riddle's own Debra Rodensky - Scholarly Communication Librarian at Embry-Riddle Aeronautical University Hunt Library at the Daytona Beach campus - discusses the practicalities of adding works to Scholarly Commons. Copyright issues are discussed. 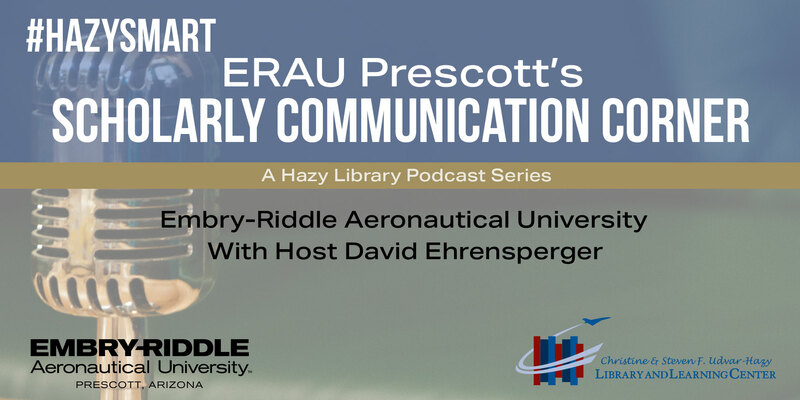 This is the inaugural episode of the podcast ERAU Prescott’s Scholarly Communication Corner with host David Ehrensperger, Scholarly Communication and Research Librarian at the Christine & Steven F. Udvar-Hazy Library & Learning Center on Embry-Riddle Aeronautical University’s Prescott Campus. It will be available on Monday, September 10, 2018. This episode starts the podcast series with guest Anne Marie Casey, Dean of Scholarly Communication and the Library at Embry-Riddle Aeronautical University out of the Daytona Beach, Florida campus as the host and guest discuss the origin, present, and future of Scholarly Commons – ERAU’s institutional repository.